Working on a computer all day long and then watching TV in the evening are fairly sedentary activities, which, if practiced in immoderation, can lead to a fairly sedentary life. 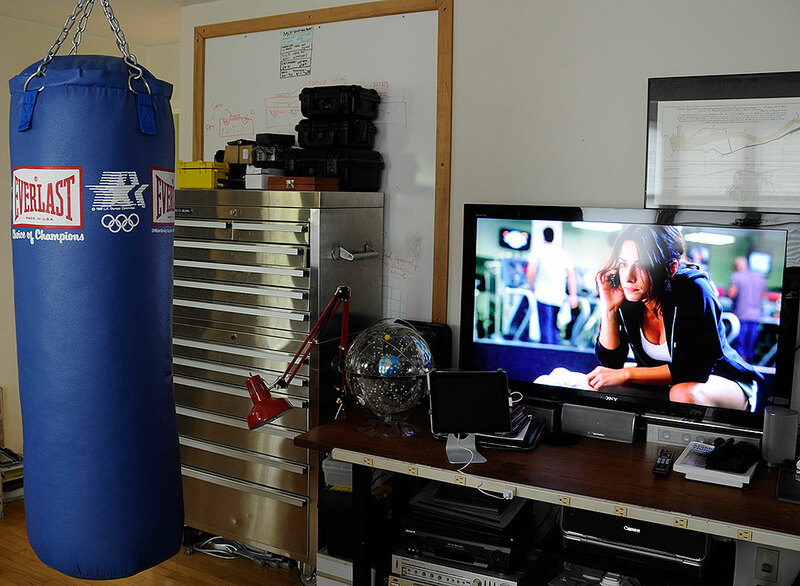 We at RainyDayMagazine have solved that potential/probable outcome by installing a heavy punching bag in the office for anyone interested in a quick workout whilst on duty. We’ve had the bag for a while (it is an Everlast commemorating the 1986 Olympics), but are not entirely certain when it came into our possession. At 80 pounds, the bag is one of the heavier models. Hanging it securely required us to mount the hardware directly into the studs in the ceiling. Everlast has mounting hardware designed for hanging these types of bags, but we opted to roll our own with a few dollars of hooks and springs from Home Depot (1 eye hook, 3 S-hooks, 1 spring). We have not had any problem with the rig since it has been up, even when used in a pummeling manner. Hitting the bag with with bare knuckles is a good way to toughen them up, but that can be hard on the skin until the skin has been conditioned, which it isn’t until you have started hitting the bag with bare knuckles… For those just starting on a regimen, we would suggest using a pair of training gloves. The gloves have a metal rod that the fingers close around (which gives the hand something to grip and helps disperse the impact of the, uh, impact) and a layer of padding that cushions the knuckes (and anything else that may be involved–voluntarily or not–in the punch). 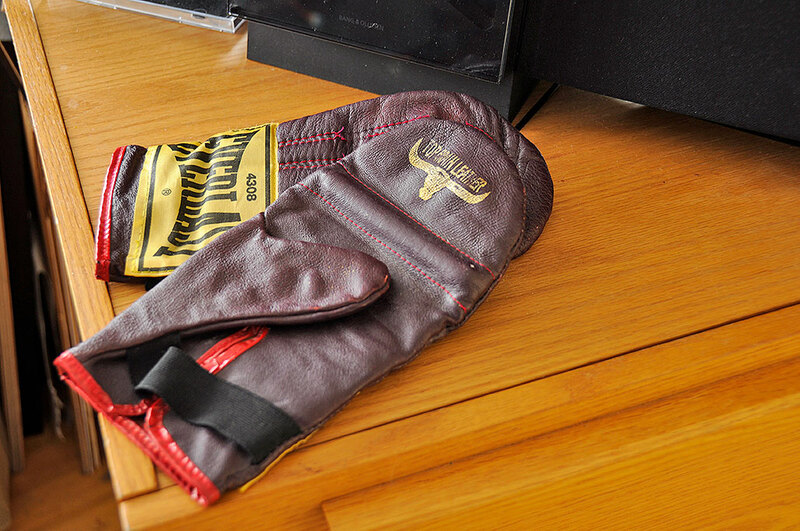 Our gloves are a few years old, and the padding has since dried out and crumbled to dust (literally). The gloves at this point are nothing more than just a thin sheet of leather. We could get new ones, but we like them this way because they offer just enough protection for the knuckles, yet not so much that the knuckles don’t feel some pain when we hit the bag for an extended period of time. Having a heavy bag hanging in the office may make clients a little nervous when they first visit, but at least it doesn’t fill their heads with naughty thoughts when we have only the chains hanging from the ceiling.